If you take this course, you will read Sappho’s lyric love poetry, Homer’s epic accounts of the Trojan War, Vergil’s tragic love story of Dido, and Ovid’s myths while examining how later writers and artists have adapted these ancient works in examples ranging from early modern poetry to contemporary popular culture. The influence of ancient Greek and Roman texts has permeated the Western tradition for millennia. In our sampling of some of these works, we will read the lyric love poetry of Sappho, Homer’s epic accounts of the Trojan War and its aftermath in The Iliad and Odyssey, selections from Virgil’s work, and excerpts from the mythological poetry of Ovid. One aim of the course will be to understand these texts in their own literary and historical contexts, but we will also look at how later writers and other artists have used these ancient works, with examples drawn from early modern poetry to contemporary popular culture, including the Coens’ film O Brother, Where Art Thou? and Margaret Atwood’s play, The Penelopiad. Key concepts for examination will include adaptation, influence, translation, parody, and appropriation. This course requires the occasional use of Moodle to supplement the work done in class. Our readings will include several versions of Sappho’s lyrics (in photocopies alongside the book ordered for the course), a good part of The Iliad, the whole of The Odyssey, a short excerpt from The Aeneid (online or in photocopies) and excerpts from Metamorphoses. Along with these texts from antiquity, we will also look at translations and adaptations in English literature, art, and film throughout the ages (mainly through online sources) and in Atwood’s play, The Penelopiad. If not, Winter: Fragments of Sappho. Trans. Anne Carson. Homer. The Iliad. Trans. Peter Green. Homer’s The Odyssey. Trans. Richmond Lattimore. Ovid. Metamorphoses: A New Translation. Trans. Charles Martin. Along with these texts, we will also look at translations and adaptations in English literature, painting, sculpture, and dance throughout the ages. 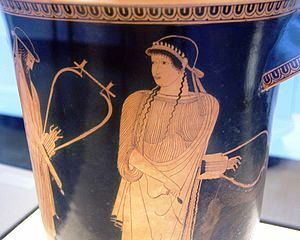 Essay: Literary analysis of two translations of Sappho. 1500 words. and an analysis of 1500 words. Due dates will be announced in class and on the Moodle site. Further details about each assignment and instruction on essay writing will be given in class. You need to be in class every day ready to work if you want to learn something and contribute to others’ learning, and if you want to be prepared for your writing assignments and exam. Attendance, of course, is part of your participation grade, but I will also take into account the quality and consistency of your contributions to class and group discussions. More details will be given in class. Demonstration of professional and courteous behaviour throughout the course will also contribute to this grade. Unprofessional and discourteous behaviour, such as texting, walking out of class in the middle of discussions, talking while others are discussing, watching non-course-related content on your computer, and not bringing the text to class, will have a detrimental effect on your participation and attendance grade. The final exam is an opportunity to think about the course readings in new combinations and from a broader perspective. Normally, the exam consists of passages selected from ones that we have discussed in class and that you are asked to identify, analyze, and compare. Obviously, the best preparation for the exam is attending every class, bringing the text with you, keeping up with the assigned readings, and taking notes on the class discussions, including marking which passages we analyze together in class, along with actively addressing comments made on your essays and exercises. The Sirens. O Brother, Where Art Thou? Dir. Joel & Ethan Coen. 2000. This course uses Moodle, an online course management site, to supplement the information given in class. You can find a link to Moodle on the Mount webpages. You will be asked occasionally to use the discussion forum and possibly other features on the Moodle site. These features will be demonstrated in class. You will be expected to check the course Moodle site at least twice a week, preferably some time before each class, to make sure that you are up-to-date on all the latest course assignments, readings, and announcements. Dido’s Lament. Mark Morris. 1989. You can read more details about the course in the links above. The Perseus Digital Library. Tufts University. A huge site that contains texts and images. Classical Myth: The Ancient Sources. Laurel Bowman, University of Victoria. This site contains images, texts, a timeline, and other useful information. The image used above is a detail from an Attic vase (c. 470 BCE) illustrating Sappho and Alcaeus. This image is taken from Wikimedia Commons. Information about the vase can be found in the Perseus Digital Library. The banner image at the top of the page is from arshtcenter.org and illustrates Mary Zimmerman’s play, Metamorphoses.